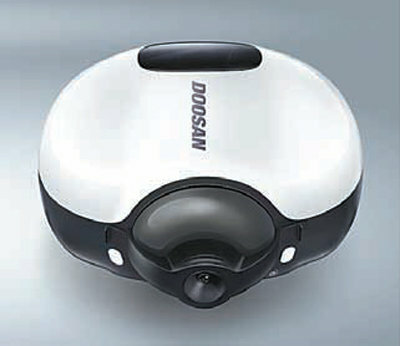 Doosan unveils its first drone fuel cells. September. 07, 2018 08:09. bjk@donga.com. Doosan Corporation plans to make a foray into the drone fuel cells market, which the Korean company has been eying as its new growth business. Doosan said Thursday that it showcased its first fuel cells for drones at the 2018 Inter Drone industry fair held in Las Vegas, Nevada, the United States from September 5 to 7. The DP20 is Doosan’s first self-developed battery for industrial drones. The company independently developed a fuel cell pack for drones in 2016. Fuel cell packs are devices that use electrochemical reactions between hydrogen and oxygen to generate electric power. The DP20 features easy replacement of its fuel source by attaching or detaching an oxygen container. While existing batteries can power drones for about 20 to 30 minutes, the DP20 allows unmanned aerial vehicles to fly for over two hours on a single charge. Industrial drones are used to monitor solar and wind power plants’ facilities, prevent plant blights in forests, monitor bush fires, perform long-distance transportation of emergency materials, or conduct surveillance duties in harsh environments for humans. Doosan projects that the drone battery market will grow to about 7 trillion won (6.2 billion U.S. dollars) by 2025. The company plans to pilot-test the new product at home and abroad before starting to mass produce them in the first half of next year and cooperate with small and mid-sized companies doing drone businesses.